I don't know much about the famous Mexican painter Frida Kahlo, but I DO know her iconic face, which she captured in her self portraits. I also love when picture books introduce children to real-life people or historical events, so I thought I'd give this one a read. Visually, this book is stunning. I'm not sure what techniques Morales used to create the illustrations, but I would describe them as a combination of doll portraits and collage. The sparse text also beautifully accompanies the illustrations, in both English and Spanish. 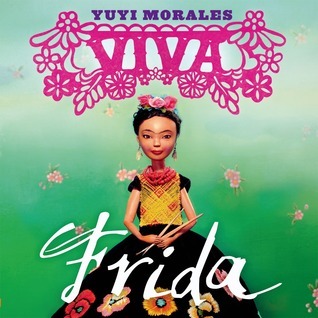 I almost wish the text had gone into more depth about who Frida was. Out of context, the story could be about anyone, imaginary or real. The author's note in the back gives the reader historical context, but let's face it, no independent reader is going to check out the "fine print" on her own, and I feel like many parents may skip it as well. Still, it is a book of note for its illustrations and beautiful, bilingual text.